HomeInsight IdMCan OAuth do what SPML hasn’t? Can OAuth do what SPML hasn’t? I spent an interesting week at HQ last week, trying to deal with some of the craziness that occurs every time a major release is on its way. But far more interesting were all the identity management conversations I engaged in during the course of the week – in hallways, over meals and especially over drinks. Suffice to say that it was a very thought provoking week. I wanted to use this forum to expand on a conversation that started in one venue, and then spilled over into the Twitterverse. Had an interesting discussion this morning on how OAuth could be to federated provisioning what OpenID is to federated SSO. Any takers? Federated provisioning is about creating an account with appropriate privileges in underlying systems on the Relying Party side when triggered by an authentication event (user comes to the RP service from the Identity Provider, or IdP, side). Further, the authentication token being presented to the RP does not contain sufficient claims (attributes, etc) for the systems on the RP side to create the necessary account (there are other scenarios, of course, but this is the common one I am trying to address). Consequently, we have a need for the RP to get provisioned with data from the IdP side. Now in my post “The Thing About Federated Provisioning“, I pointed out that there are challenges in doing all of this just-in-time. Enterprises often resort to out-of-band pre-provisioning of accounts across the domain boundaries, which is where SPML proves to be adequate. But the demand for JIT mechanisms still exists. The cloud exacerbates this problem greatly, because pre-provisioning is pretty much impossible when you move up to the scale and loose coupling of the cloud. And the nature of SPML requires that extensive integration be done before the connection between the RP and the IdP can go live. And this is where I believe OAuth could play a role. OpenID is already viewed as a lightweight solution for enabling federated authentication, with attribute exchange supporting the simpler data transport scenarios. We could now augment this flow by adding an OAuth-based data provisioning mechanism that allows a Provisioning Service on the RP side to connect back to a Provisioning Service on the IdP side and retrieve the data it needs to create the underlying accounts. Being based on OAuth, this would require far less integration than the SPML based approach would. 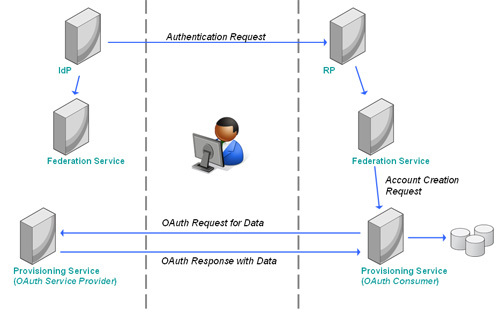 Mapping the concepts, the RPs Provisioning Service becomes the OAuth Consumer, while the IdPs Provisioning Service becomes the OAuth Service Provider. The interactions are outlined in the diagram below (greatly simplified for the purposes of this discussion). But when you look at the actors involved in OAuth, you run into one problem – OAuth was defined with users in mind, not enterprises. So you find the User as part of the protocol, but nothing that would allow the Enterprise to have a say in the exchange. And this raises an interesting challenge. Just like there are security issues to resolve in the OpenID protocol for it to satisfy enterprise requirements, there are policy challenges that would need to be resolved in the OAuth exchange as well. Connecting the services only requires that the user in the flow provide their assent, but if OAuth were to step in as a federated provisioning protocol, it would require some way for the enterprise to inject (fine-grained) business policy into the exchange. And what if approval workflow needs to enter the picture? One thought would be to introduce an IGF style declarative policy mechanism that would allow the services on each side of the exchange to declare intent and policy, thereby allowing some automated decision making that ensures that security and business policies are honored by the exchange. Because when you are talking about fed-prov, a one-size-fits-all construct will be a non-starter. My posting on twitter did generate some good feedback from folks like Eve Maler and Ashish Jain. I am interested to get people’s thoughts on the viability of this idea, and whether you think adding OAuth to provisioning systems would be part of the move to enabling enterprise identity management systems for the cloud.